Calvin Lai describes his art as “the monkey” that climbed on his back while he was making a self-portrait in kindergarten. His fascination with rendering drove him towards realism, and he began teaching himself the basics of value and perspective at a very early age. Growing up in Los Angeles, his addiction to art progressed, and his favorite subject became faces and figures. 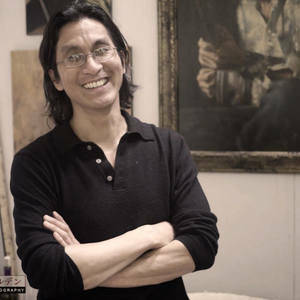 He eventually moved to San Francisco to attend San Francisco State University in order to study drawing and printmaking. It wasn't until 2008, when he enrolled at the Academy of Art of San Francisco, that he began painting seriously. Since then he has pursued the development of his painting skills, showing in galleries, group shows, juried exhibitions, and has appeared in the Southwest Art magazine. Oil paints are now his primary medium. Calvin still focuses mainly on figurative and portrait painting, developing several ongoing series, but is also inspired by landscapes. Using paints, brushes, and determination, Calvin captures the unique and compelling characteristics of every subject matter he pursues.